Dublin, Ohio – The last time the Memorial Tournament needed extra holes to decide things at Jack’s place, the legendary founder and host was still playing golf on the PGA Tour. It might have also been the last time the Memorial Tournament enjoyed four days of chamber of commerce weather. 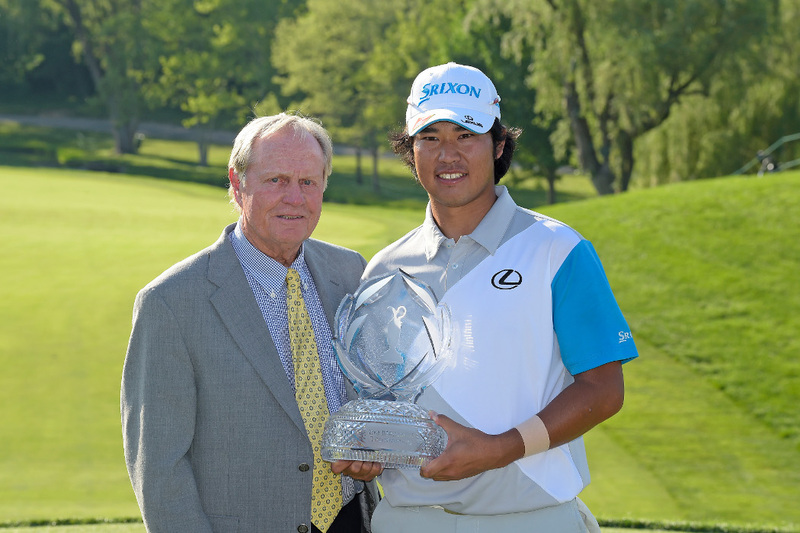 Or maybe a better measure of historical significance is to point out that the 2014 Memorial winner, 22-year-old Hideki Matsuyama of Japan, was 3 months old the last time the Memorial Tournament was decided in a playoff. But then that all seems to dovetail with what can only be considered a memorable week in Central Ohio. Consider that first-round leader Rory McIlroy scorched the course to the tune of 63 strokes on Thursday just two days after a transatlantic flight, a timely victory at the PGA BMW Championship on the European Tour and a very public split with his fiancée, Caroline Wozniacki. It’s also worth pointing out that McIlroy scored that round on a bum wheel after straining the medial collateral ligament in his left knee Thursday. A second-round 78 had the fan favorite limping into the weekend. Masters champion Bubba Watson became the man to beat, but he had a sloppy back nine on Sunday which dropped him out of the lead and into third place. Watson, who led by a stroke to begin the final lap, was 3 under par and cruising through 13 holes before he bogeyed No. 14 after his drive sailed left, and followed that with a blast that appeared headed for Indiana at the 15th hole. The two-time Masters champion made a double-bogey 7 after hitting his tee shot out of bounds on the par 5, a stunning miscue considering that he’d played the par 5s in 11 under heading into the final round, but he struggled on Sunday to a 1-over total. The solace for Watson was that his third-place finish beat his previous best at Muirfield Village by 20 places, and it was an indication he has no plans to suffer through another post-Masters slump like he did after winning his first green jacket in 2012. Similarly, there were plenty of consolation prizes for Kevin Na, following his runner-up finish. Na, who teed off two hours and nine minutes before and seven strokes behind Watson, carded a bogey-free 64 to move to 13 under par and seemed poised for a compelling clubhouse rally. He watched as first Watson fell away, followed in order by Matsuyama, who failed to make a par over his last six holes after climbing into the lead with a birdie at the 13th hole. It seemed as if Matsuyama’s title chances were doomed on the 72nd tee when the 22-year-old flared his drive to the right and, in reaction to his miscue, broke his driver on the ground. He scrambled for birdie to finish tied with Na at 13 under. His driver was not as fortunate. The Rules of Golf allow for a player to replace a club for a playoff, but Matsuyama went with a 3-wood on the first playoff hole (No. 18) and found a fairway bunker. Na followed with a tee shot that found a creek left of the fairway and the up-and-coming Japanese star rolled in a 10-footer for par for his first Tour victory. For Matsuyama, his eventful final round provided a measure of poetic justice. Less than a year ago he spent the week at Muirfield Village Golf Club playing the role as affable sidekick to Adam Scott — with whom he was paired again on Sunday — at The Presidents Cup. Matsuyama and the International side lost that Presidents Cup in anticlimactic fashion, which makes his memorable Memorial a victory to savor.